Sarex Ageless Face Moisturizer Review: Is This A Scam Or Legit? 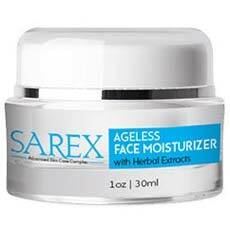 The Sarex Ageless Face Moisturizer is a skin care serum used to keep your skin hydrated from the inside out. The skin cream is claimed to help you restore back your youthful skin together with its glow. This cream will enable you get of wrinkles, sagginess giving you a firm and boost the elasticity of the skin. The skin cream is also known to conceal sun spots and blemishes. It will keep your skin hydrated or rather moisturized to avoid cases of dryness. In the case you do not cancel your shipping; you are signed to an auto-ship program. Here you are charged monthly with a $94.94 for a bottle with a $10.95 for shipping and handling. Total costs come to $105.89. They offer a single refund, eligible only for the first 30 days of purchasing the product. The manufacturers, Sarex, claim that their skin care product is the new Hollywood secret. They state that this product will help reduce 84% of your wrinkles and fine lines, reduce the occurrence of dark circles by 73% and boost the production of collagen by 95%. They promise its customers that they will experience the outcome of the skin care benefits in as short a time as eight weeks. The Sarex Ageless Face Moisturizer is made up of carefully selected and blended ingredients that are meant to be gentle on your skin. The cream is made of crystals similar to those of cosmetic injection and use the smart absorption technology. The cream will restructure your skin from the cellular level such as by increasing the collagen levels, muscle contraction, renewing of skin cells and skin hydration. The cream also works towards the outside by concealing and smoothening. Used to get rid of sunburns. It is also used to keep the skin hydrated thus preventing it from going dry. It has no greasiness to it. Is rich in Isoflavone which help balance the hormone cycle and thus known for treating skin problems. Helps keep the skin moisturized. It also maintains a thicker skin to promote the gentleness and suppleness of your skin. Helps reduce eye bags and keeps your skin smooth and soft in appearance as opposed to aged skin. Extracted from water melon peels. Boosts the production of collagen which helps promote skin elasticity and firmness. Contains essential nutrients such as vitamin D,A and E. help maintain a healthy face by working from the cellular level of your skin. Helps get rid of wrinkles and sagginess. Eliminates eye bags and crow lines. Accelerates the renewal of skin cells. Promotes a healthy skin structure. Eliminates forehead lines and chin creases. Only sold online. Thus hard to find on retail stores. Even then, it is outrageously expensive for a single bottle. How do I use Sarex Face Moisturizer? There are just three easy steps. First cleanse your face. Take a pea sized amount of the cream to the palm of your hand. Then in a circular motion apply the cream to your face and neckline. Are there any side effects to using the Sarex Face Moisturizer? Unless you are allergic to any of the ingredients used in the formulation of this supplement, there are no side effects to this face moisturizer. The skin care cream is best stored in a cool dry place and especially away from the reach of children. Do they offer any money back guarantees? Unfortunately for such a high promising product they do not offer any money back guarantee. The product has been reported to be very effective with a fulfillment of its promises to several customers. Despite the great moving benefits offered and promised by the product their pricing is way too high. It comes with an auto-ship program. Not unless you can really afford it, there are other products you could consider with the same benefits. The Sarex Ageless Face Moisturizer has been highly reviewed on a positive note. Most have truly complemented the cream's effectiveness and safety. The one thing that really worries about Sarex moisturizer is its pricing. For one bottle at approximately $110, isn't it relatively very expensive especially compared to other similar products in the market? Besides, there are other good products that offer the same benefits at a much lower price.